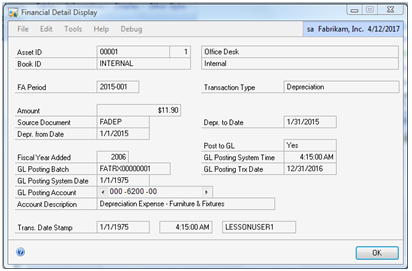 Dynamics GP has a nice module for tracking and maintaining Fixed Assets. However, many users have trouble figuring out the history of a specific asset. Often, users find that while reviewing fixed asset general ledger postings something looks wrong, but they can't figure out where to go in the Fixed Asset module to validate how the transactions were posted. 1. In Dynamics GP, select Financial from the Navigation Pane. 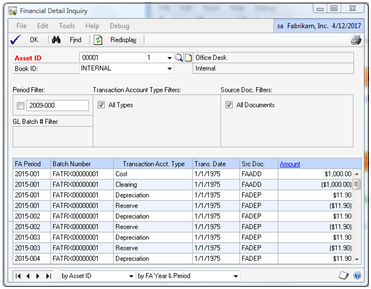 Then select Financial Detail under the Inquiry | Fixed Assets headers. 2. Use the lookup button (indicated by a magnifying glass) to select asset 00001 having suffix 1. Set the Book ID to INTERNAL. 4. The grid at the bottom displays the Fixed Asset Period, GL Batch Number, Account Type, Date, Source Document, and Amount. The key fields are Transaction Acct. Type and Src Doc. These fields provide details about the type of transaction. For example, the first two lines demonstrate the Cost and Clearing entry for the initial purchase of the asset. 5. The Batch Number is the batch sent to the GL. It can be reviewed using a SmartList. 6. Below that is the first depreciation entry transaction. It affected the Depreciation and Reserve accounts. The Financial Detail Inquiry window provides all of the information necessary to trace all of the transactions related to a fixed asset. This is extremely useful for understanding what actually occurred. Any number of items can affect fixed assets including incorrect depreciation settings, wrong asset lives, and problems with the fixed asset calendar. Being able to understand all of the transactions that affect an asset is an important troubleshooting tool that is often overlooked.